Santa is coming to a town near you this month. 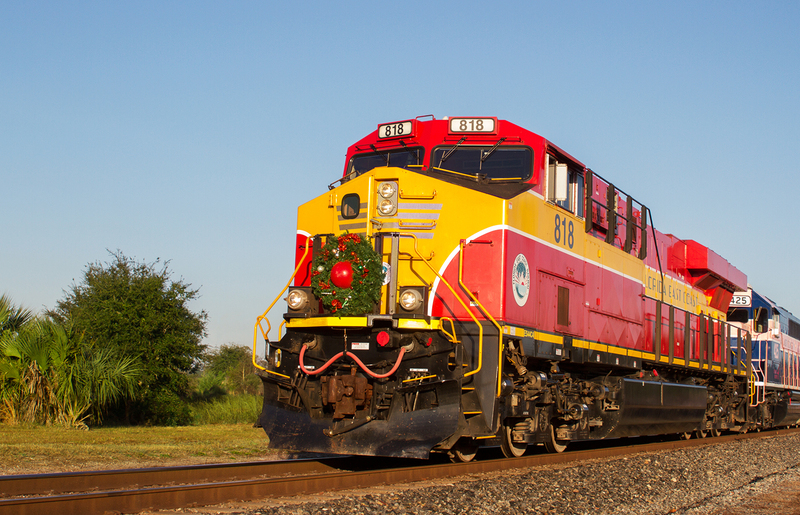 This year marks the seventh annual Christmas Train operated by Florida East Coast Railway in coordination with the U.S. Marine Corps Toys For Tots Foundation. The train will depart Saturday, December 10 and will run along the railroad's 351-mile mainline on the east coast of Florida, from Jacksonville to Miami. JACKSONVILLE, FL--(Marketwired - December 01, 2016) - Santa is coming to a town near you this month. This year marks the seventh annual Christmas Train operated by Florida East Coast Railway (FECR) in coordination with the U.S. Marine Corps Toys For Tots Foundation. The train will depart Saturday, December 10 and will run along the railroad's 351-mile mainline on the east coast of Florida, from Jacksonville to Miami. The 2016 FECR Christmas Train will make eight stops during the journey. Along the way Santa Claus will be spreading holiday cheer to all who come out to see him. A local Toys For Tots coordinator -- a U.S. Marine Corps service member, will be present at each stop to accept the FECR Christmas Train donations, and distribute throughout the community. The FECR Christmas Train is a 501c3, so anyone who would like to make a donation to the organization can receive a tax deduction. All donations will go toward children and teens in need in the local community. Since FECR President and CEO Jim Hertwig started the program six years ago, it has continued to see growth, donating close to 270,000 toys. "Last year alone over 1,000 children attended our event, and 16,000 toys were donated," said Jim Hertwig. "This event is, and will continue to be a favored tradition for the FECR family. We are proud to be able to once again work alongside the Toys For Tots Foundation to contribute to those in need during the holiday season," he said. The Florida East Coast Railway (FECR) is a 351-mile freight rail system located along the east coast of Florida. It is the exclusive rail provider for PortMiami, Port Everglades, and Port of Palm Beach. FECR connects to the national railway system in Jacksonville, Fla., to move cargo originating or terminating there. Based in Jacksonville, Fla., FECR provides end-to-end intermodal and carload solutions to customers who demand cost-effective and premium quality.